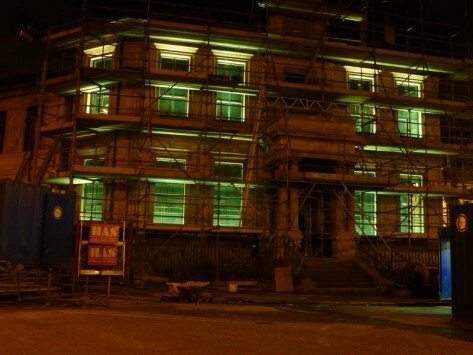 Funding from the Heritage Lottery Fund has secured the future of Maryhill Burgh Halls. A grant of £1m will restore the Halls and adjacent former police station, transforming both into a hub for community life providing a café, offices, recording studio, nursery, meeting rooms and public garden. The Halls will slot into the wider regeneration of the Maryhill area as an important historic reminder of a past that was largely swept away during comprehensive redevelopment. They will form an integral part in the development of a new swimming pool and leisure centre on adjacent ground. A collection of 20 stained glass windows, designed by the studio of Stephen Adam, will be conserved and displayed on a rotational basis. These depict the 19th century trades of Maryhill which encompassed linen bleachers, canal boatmen and calico printers. 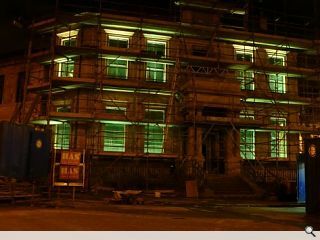 Images of these pieces have been carefully recreated using animation and light by DO Architecture, this display is being projected upon the façade of the building each evening in the run up to their return. Works have been conducted by JM Architects with a conservation management plan put in place by Austin Smith Lord. Buro Happold acted as structural engineer.